In the last tutorial we displayed the list of blog posts by fetching them from the database. Now let’s move one step ahead and add the functionality of creating posts. This time, we are going to explore a lot of exciting features of AdonisJs including Form Builder and expressive Validator. Quickly register a couple of new routes inside the routes file. We registered two routes. One is to show the form to create the post, and the other one is to handle the POST data of the submitted form. Let’s create the create and store methods on the existing PostsController. Finally, we need to create the view using the ace command. We will make use of Form Builder to set up the form for creating a new post. Quite a lot to cover here. Form builder provides some convenient methods to create HTML forms. The form.open creates the form tag. Here we make use of action property to define the controller method for handling the POST request. Form action and the method will be filled automatically for you. All of the forms are protected by CSRF protection. So we need to set the csrfField to make sure we can submit forms without any restrictions. 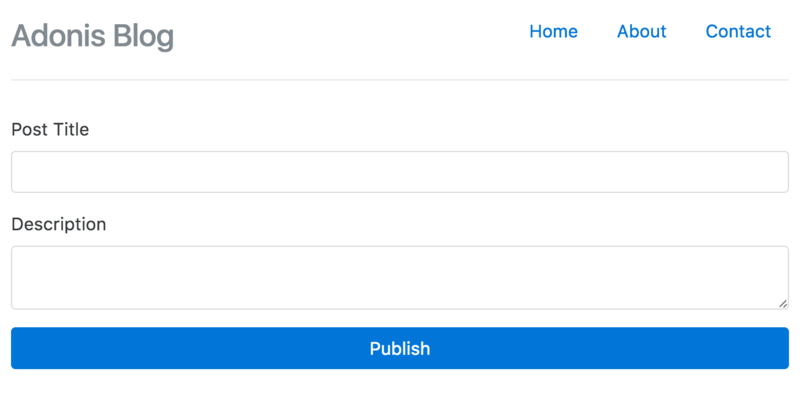 Everything else is a part of standard Form Builder API to create the input fields and the submit button. Visit http://localhost:3333/posts/create and you will see a nice looking form to create the posts. Validating user input is so important as you can never trust the data provided to you. AdonisJs got a beautiful validator to make this task a lot easier for you. Validator is not part of the base installation, which means we need to pull it off from the npm. Next, we need to register the provider and create an alias. Don’t worry if you do not understand the providers completely. It is not something you are supposed to know from day 1. That’s all required on the setup front. Now we are going to validate the form input inside PostsController. 1 The request.only method will fetch the values of the defined keys. 2 Here we validate the user input with the defined rules using the validate method. 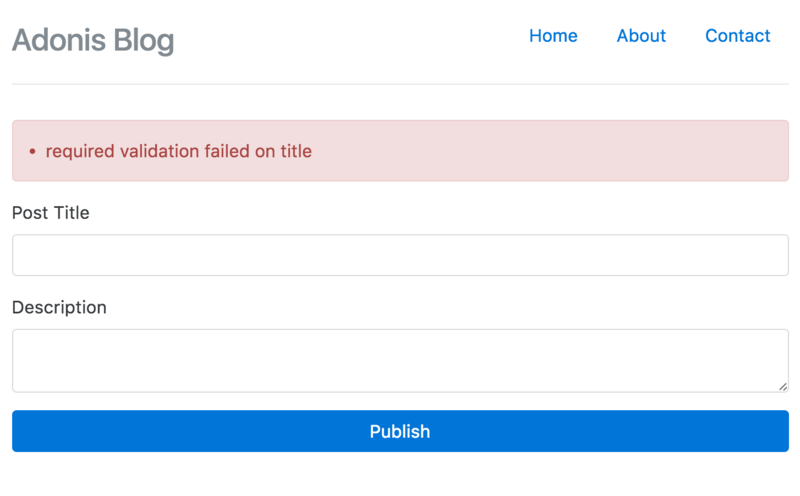 3 If validation fails, we redirect the user back and flash the error message along with the original values for title and content. 4 If validation passes, we create the post using the Post.create method. Next, we need make some modifications inside our create.njk view to show the errors returned as flash messages. Enter the below piece of code just before the form.open tag. The old method is used to fetch value for a given key from flash messages. Here we need to pull the errors key for getting the errors sent from the Controller. Let’s refresh the page and try to create a new post with empty title and content. Wow, this is fun. We have got a working form with super easy validation and in-place error handling.